Egypt's journalists’ syndicate filed a report on Sunday accusing the interior ministry of being behind the disappearance of journalist Mahmoud Mostafa Saad, a syndicate statement read. Saad, a journalist working for Al-Nahar private TV Channel, was travelling on Friday to London on a student visa when he called his wife telling her he was being detained at Cairo airport for unknown reasons. Saad has not been heard from since the phone call to his wife at 3pm on Friday. The interior ministry denies having any knowledge of Saad’s whereabouts. This is the second such report from the journalists’ syndicate this week. On Saturday, the syndicate filed a report to the general prosecution accusing the security forces of being responsible for the disappearance of Hisham Gafaar and Hossam El-Din El-Sayed. In its report, the syndicate said security forces stormed the houses of the two journalists on Wednesday and Thursday, detaining them in an unknown location without giving them the right to a lawyer. 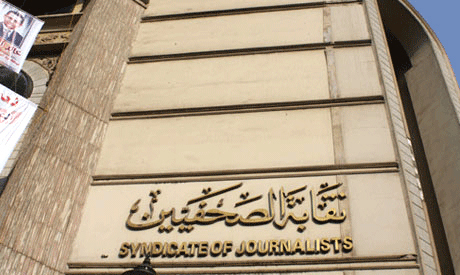 The syndicate demanded that the charges against the two journalists be announced as well as the date they would be referred to the prosecution for questioning so that a representative of the syndicate could be present during the investigation. In September, Egypt pardoned two Al-Jazeera journalists, Mohamed Fahmy and Baher Mohamed, who were sentenced to three years in prison for charges including "spreading false news." The Egyptian government has repeatedly denied that it imprisons journalists or reporters for their work, arguing that all those jailed, including the Al Jazeera journalists, were charged with or convicted of crimes.